NeoFinder offers a useful integration directly into the Services menu of your Mac! If you select a single file in Apples Finder, you can have NeoFinder search its database for all files for this particular name. The command Find File in NeoFinder will do that for you. If NeoFinder is not yet running, Mac OS X will do that for you. Please note that the entries in that Services menu change, according to your installed applications. 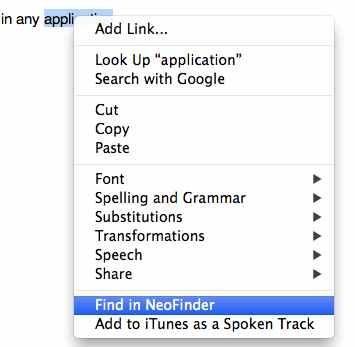 Also please note that you must install NeoFinder inside /Applications, or any subfolder of it, or Mac OS X won’t pick up the commands that NeoFinder offers for you. 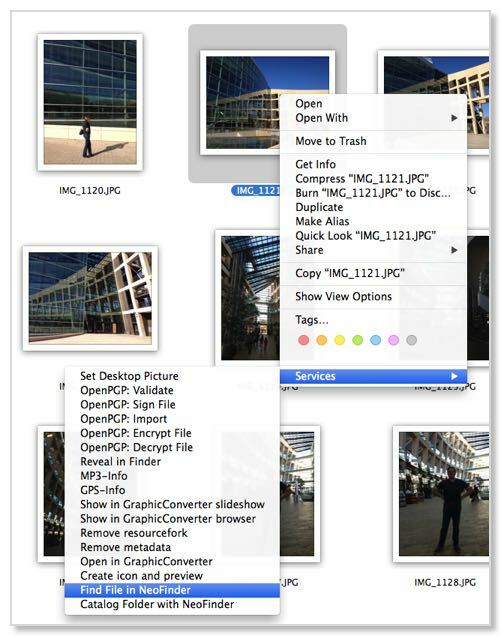 For a folder in Apples Finder, NeoFinder offers to Catalog Folder with NeoFinder. That is also true for all volumes you select there.